Please read these conditions carefully before using New Hall Kiln Dried Firewood website. By using this website, you signify your agreement to be bound by these conditions. Customers or visitors to this web site are referred to as "you". New Hall Kiln Dried Firewood are referred to as "us" or "we". After choosing your payment method, select 'Confirm Order' to place your order. You will then be redirected to the Payment Gateway. We DO NOT store credit card details. This means that nobody can steal your details as we simply do not have them! We use PayPal as our payment processing partner who use the most secure up to date encrypted SSL (secure socket layer) when transferring transaction details in the checkout process. This means that no information submitted during this process can be examined, used or modified by any unauthorised third parties. You can pay by most major credit and debit cards. Your details will be encrypted to keep them secure. Once your card details have been processed by PayPal, you will be able to view an onscreen confirmation that your order process is completed and you will also receive an email invoice confirming your order. Additionally, you will also be able to login to your ‘New Hall Kiln Dried Firewood’ account to view and check the status of your order. When you place an order to purchase a product we will send you an e-mail confirming receipt of your order and containing the details of your order, including transaction and order reference numbers. Your order represents an offer to us to purchase a product, which is accepted by us when we process payment for your order. When we accept your order, we will send a Dispatch Confirmation E-mail. Any products on the same order which we have not confirmed in a Dispatch Confirmation E-mail to have been dispatched do not form part of that contract. If you have incorrectly entered your email address your confirmation and dispatch email will fail. So long as payment has been processed successfully this will in no way affect your order. Failure by us to send a receipt confirmation email or dispatch confirmation email in no way invalidates your offer or our acceptance of your offer. The contract between New Hall Kiln Dried Firewood and the customer will be deemed to be fulfilled on delivery of your order in good condition. Where the order is not delivered in good condition, the contract between New Hall Kiln Dried Firewood and the customer will be deemed to be fulfilled, upon receipt by the customer of any refund due to them, as a function of the customer having notified New Hall Kiln Dried Firewood of any damage to the order, in accordance with these Terms and Conditions. All pallet based deliveries are delivered to the kerbside. While our delivery company will normally go to great lengths to ensure that your delivery is placed where you require it, the contract between yourself and New Hall Kiln Dried Firewood includes delivery to kerbside only. Please ensure that you have the means to move the pallet(s) and their goods from the kerbside to a suitable storage location. Please consult the delivery page to see the required access conditions for deliveries. 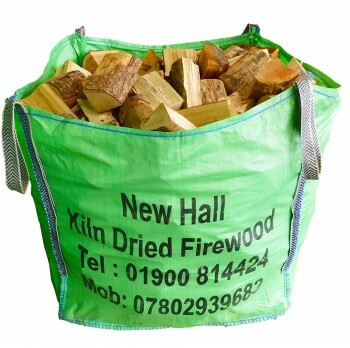 Provide to New Hall Kiln Dried Firewood by email (sales@newhallfirewood.co.uk) all evidence required to support your claim within 72 hours of delivery. 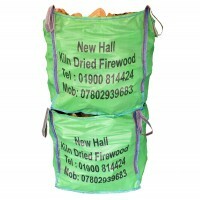 New Hall Kiln Dried Firewood is unable to add lost/unusable product to future orders. All claims will be refunded to your original method of payment. Where damages are not indicated on the delivery note New Hall Kiln Dried Firewood is not able to offer any refund where the customer could reasonably have been expected to have noticed the damages after a visual inspection of the order, or where the customer requested an unattended delivery. Provide notification of the damages to New Hall Kiln Dried Firewood within 24 hours of the delivery. We provide guidelines as to the expected delivery schedule of the relative delivery services offered by New Hall Kiln Dried Firewood. Please note that in all cases the time frames given are guides only. New Hall Kiln Dried Firewood will not be held liable, if for whatever reason, a delivery does not arrive within an expected period. Where stock is unavailable and not due to be available for more than 4 days, New Hall Kiln Dried Firewood will endeavor to restrict sales of the good in question. Deliveries are usually made within 3 or 4 working days of your order being placed. To take full advantage of this please ensure that you place your order before 4pm on any working day. We are unable to honour any specific delivery date requested in the delivery notes. Where a customer requests delivery on a specific day in the delivery notes we will pass this request on to the hauliers, but the order will still be delivered as per our standard terms for that delivery service. Where a delivery is made contrary to the request in the delivery notes with respect to a specified day of delivery, New Hall Kiln Dried Firewood will entertain no liability for failing to comply with that request. It is your responsibility to ensure that there is suitable access to the delivery location. Where a delivery is attempted, but is unable to complete due to a lack of access that you could have reasonably been expected to anticipate, we will charge a re-delivery fee. It is your responsibility to ensure that the address and delivery instructions you provide are correct. Where the address and/or instructions are vague and our haulier cannot reasonably be expected to find the delivery location from the instructions provided, we reserve the right to charge a re-delivery fee. Where the delivery location is unsuitable for delivery (as deemed by our hauliers driver), and the customer is unable to provide an alternate delivery location that is suitable, or otherwise unable to come to an amicable resolution of the delivery with New Hall Kiln Dried Firewood, the customer will be liable for the costs associated with returning the pallet. New Hall Kiln Dried Firewood disclaims all liability from any damage and/or death to any property and/or person that may occur during the delivery process. Please call New Hall Kiln Dried Firewood to let us know what has happened. Although we cannot influence the outcome of any claim you may make, we are able (in most cases) to speed up the claims process. If you are not satisfied with your purchase, contact us within 14 days of delivery for a refund. Goods should be returned in original packaging and condition. We will arrange for collection of the Goods. The cost of collection is payable by you except where you purchase as a Consumer and you are returning the Goods because of a defect, or because they were not as described. If you wish to cancel an order please do so as soon as possible to ensure that you are not liable for any return costs. If you cancel your Contract before the product has been dispatched, we will refund the full amount of your order. Unless the Goods are faulty or not as described, you will be responsible for the cost of returning the Goods to us. We will collect the Goods from you and charge you the direct cost to us of collection. If an order is cancelled or turned away (order not accepted) after the goods have been dispatched, then you will be responsible for the cost of returning the Goods to us. A delivery charge will depend on location of between £95 - £100 (per pallet) will be charged to the customer. If there were no Goods supplied, within 14 days from when we are informed about your decision to cancel. We may make a deduction from the reimbursement for loss of value of any Goods supplied, if the loss is the result of unnecessary handling by you. We will make the reimbursement using the same means of payment that you used for the initial transaction, unless you have expressly agreed otherwise. We will refund you on the credit card or debit card used by you to pay for your order. If you used gift vouchers to pay for the Goods we may refund you in gift vouchers. By default all prices quoted are in £ Sterling (GBP). Please use the currency changer at the top of the website to view product prices in an alternate currency. We endeavor to ensure that the information shown on the website is as accurate as possible. We cannot be held responsible for typographical errors on this site, including but not limited to those regarding price. We reserve the right to make changes to our web site including prices, products and terms & conditions without any notice being given. All products and services are subject to availability and may be withdrawn from sale at any time. If part of your order is not available, we will contact you for authorisation to make a partial shipment, or to ship alternative products. We will never ship an alternative product without obtaining authorisation beforehand and we do not hold "back orders" if a partial shipment is sent. Session Cookies are temporary cookies that remain in the cookie file of your browser until you leave the site. They allow you to carry information across pages of our site and avoid having to re-enter information. They also allow you to maintain a shopping basket and within registration to allow you to access stored information. Persistent Cookies remain in the cookie file of your browser for longer depending on how long the lifetime of the specific cookie is. They help us recognise you as a unique visitor by using a unique random number when you return to our website. They also allow us to compile anonymous, aggregated statistics that allow us to understand how users use our site and to help us improve the structure of our website. We cannot identify you personally in this way. The title for goods supplied remains with us until full payment has been received. We take your privacy very seriously and are committed to providing users with an Internet experience that respects your privacy. When you make a purchase we need to collect certain information to process your transaction and fulfill your order. We do not sell, rent or disseminate this information to any third party for marketing or any other purposes. We will not disclose your details to anybody unless required by law to do so or unless you explicitly give us authority to do so. Our website links to other sites. Please be aware that we are not responsible for the privacy practices of these other sites. The EU Directive on Privacy and Electronic Communications demands that member states do more to combat spam. The UK law tries to create a system that lets legitimate businesses send direct e-mail to users but attempts to stop the scammers and spammers. We only send emails to addresses that have been supplied directly to us by customers and we always remove addresses from our address book when requested to do so by those customers. Not transferred to a country outside the European Economic Area (EEA), unless that country ensures the protection of the rights of the individual to whom the data relate. You are granted a limited, revocable, and non-exclusive right to create a hyperlink to the home page of our web site as long as the link does not portray us, our products or services in a false, misleading, derogatory, or otherwise offensive matter. Which consists of or contains software viruses, political campaigning, commercial solicitation, chain letters, mass mailings or any "spam"; or any collection and use of any product listings, descriptions, or prices; any derivative use of this website or its contents; any downloading or copying of account information for the benefit of another merchant; or any use of data mining, robots, or similar data gathering and extraction tools. Causes annoyance, inconvenience or needless anxiety. All content included on the website, such as text, graphics, logos, button icons, and images belong to us, or our suppliers, and are protected by United Kingdom and international copyright laws. 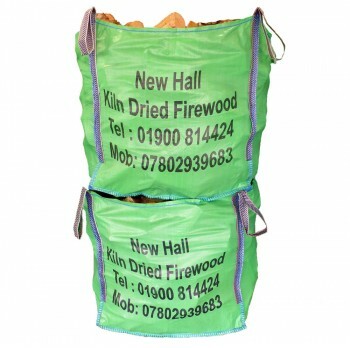 Our graphics, logos, page headers, button icons, scripts and service names are the trademarks or trade dress of New Hall Kiln Dried Firewood, and may not be used in connection with any product or service without our written authorisation. Your access to the website may also be occasionally suspended or restricted to allow for repairs, maintenance, or the introduction of new facilities or services. We will attempt to limit the frequency and duration of any such suspension or restriction. We grant you a limited license to access and make personal use of this website, but not to download (other than page caching) or modify it, or any portion of it, except with express written consent from us. These conditions in no way affect your statutory rights.